Sometimes I forget about Toon Books, and then something jogs my memory and I go in search of new releases that I missed. As I was putting together some literacy resources for the teachers I work with, I went in search of the Toon Books website and was reminded about all of the reasons I have loved Toon Books in the past. 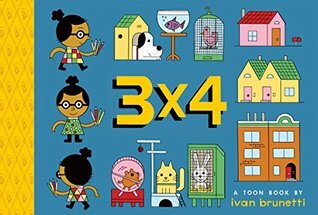 3x4 by Ivan Brunetti (Toon Books, September 4, 2018) - Check out a few interior spreads from the book. I love the combination of art and math. I have always loved combining math and art as part of the school curriculum. 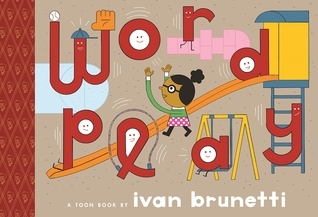 Wordplay by Ivan Brunetti (Toon Books, May 2017) - Word play can be a lot of fun and from the interior pages (see below) I like how the text and illustrations work together. Snails are Just My Speed! by Kevin McCloskey (Toon Books, April 2018) - Toon Books have a series of nonfiction Level 1 books (what they label as Level 1 may be appropriate for slightly more skilled readers due to the topic specific vocabular). I have enjoyed a number of them in the past and this one looks just as fun. Toon Books provides a number of lesson plans for most of their books. You can find them here. Check out the Toon Books website to also see which titles are available in Spanish. Look for these and other Toon Books at your local indie bookstore or community library. Do you work with readers who are starting their journey on the road to reading? 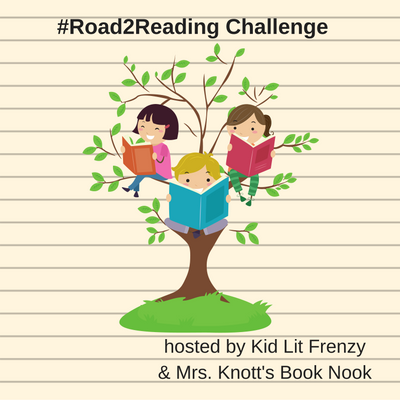 Join Michele Knott from Mrs. Knott's Book Nook and myself every Thursday as we explore books and ideas to help readers have a successful start to independent picture book and chapter book reading. If you blog or have a Goodreads page, please link up with us! Description from GoodReads: Does Catina like Houndsley's larger-than-life cousin more than she likes him? The charming friends return in this relatable tale. When his cousin Wagster comes for a visit, Houndsley is excited. Wagster is all adventure and enthusiasm and razzle-dazzle, and all his friends love him. Even Catina thinks Wagster is fun and good at everything, and pretty soon Houndsley is starting to feel a little bit invisible. But Houndsley and Catina are best friends, and certainly Cousin Wagster won't change that -- right? James Howe and Marie-Louise Gay have created a tender and funny story about some of the ways that friendships can change, and how they also stay exactly the same. Houndsley and Catina are back and this time they have a visitor. Houndsley's cousin Wagster has come into town and spending time with Houndsley and his friends. Wagster is quite the character and within three chapters Howe does a nice job in capturing all of the emotions of having someone "bigger than life" visit. Houndsley especially feels the strain of Wagster's visit and at times feels inadequate. Of course, Houndsley and the others learn that some people are a "beautiful butterfly that makes your world brighter but then flies off" and others are "beautiful butterflies that make your world brighter and stay". Friendship stories are always a fund read and typically very relatable for children. The latest Houndsley and Catina book is no exception. If you want more Houndsley and Catina check out Houndsley and Catina: Through the Seasons. Rosie is a good dog and a faithful companion to her owner, George. She likes taking walks with George and looking at the clouds together, but the closest she comes to another dog is when she encounters her reflection in her empty dog bowl, and sometimes that makes Rosie feel lonely. One day George takes Rosie to the dog park, but the park is full of dogs that Rosie doesn't know, which makes her feel lonelier than ever. When big, loud Maurice and small, yippy Fifi bound over and want to play, Rosie's not sure how to respond. Is there a trick to making friends? And if so, can they all figure it out together? I have been looking forward to this book and recently had a chance to read it. I wasn't exactly sure what to expect. The size was not quite a standard picture book nor was it a typical early reader. It happens to be somewhere in between. Once you open the book, you realize that it defies further classification. Inside the book, it was also not quite a picture book and not quite an early reader and not quite a comic book format, but really a little of all of it rolled into one. DiCamillo, in nine short chapters, tells the story of a dog named Rosie. Initially, Rosie is lonely. She likes her owner George but something is missing. At first, Rosie isn't sure that the dog park was the solution to her loneliness. However, over time, Rosie develops an unlikely friendship with Fifi and Maurice. Fans of dog books, especially ones where the dog does not die, will come to love Rosie and her friends. I do look forward to possible future Rosie books. Now is it too much to ask for a second book that features cats? Look for a copy of Good Rosie! at your local independent bookstore or public library. Curious George meets Mr. Bean in this adorable new picture book series from author-illustrator Jeff Mack that follows the loveable Mr. Monkey on his wacky adventures. Mr. Monkey bakes a cake. He can’t wait to win a ribbon! But first he has to carry it to the contest. I read a lot of early readers. I appreciate how hard it is to write for very beginning readers. Most early readers serve a purpose of providing books for new readers to build reading skill and confidence. Since students do not spend a long time in early readers and move on fairly quickly to early chapter books and transition books, volume of books likely outweigh quality of story. As a result, I rarely find a book that is so well done that I want to read it over and over again. However, it does happen. I do find early readers that I love and get really excited about. When I picked up Mr. Monkey Bakes a Cake, I was expecting another so-so early reader. Wow, I was certainly surprised. Jeff Mack has done an outstanding job of keeping text controlled and patterned but also engaging. I have read this book a couple of times trying to figure out what he did to really make this book soar. I suspect that a significant part of it his success is due to the fact that he has created a funny and likable character in Mr. Monkey. Yet, I suspect it is so much more than just a likable character and engaging text and laugh out loud humor. 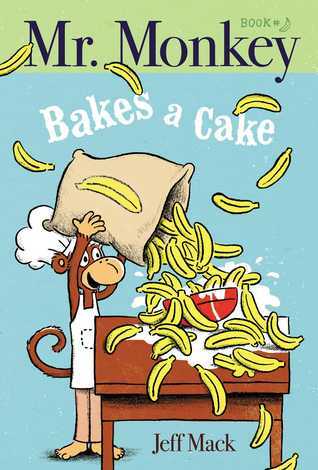 I think I might just read Mr. Monkey Bakes a Cake once again under the guise of trying to figure out how this book knocks it out of the park. Don't miss Mr. Monkey Visits a School, which also came out on July 3rd. Look for both these titles at your local indie bookstore or community library. In the past, I have featured various READY-TO-READ series from Simon Spotlight. They have a number of nonfiction titles that are very appropriate for early readers. Their latest series is called TAILS FROM HISTORY and are essentially pet biographies of animals belonging to famous individuals. Both books are classified as a Level Two reader and contains longer sentences, high-interest vocabulary words (and in some cases simple chapters). Description from GoodReads: Dip a toe, paw, or fin into history with this fact-tastic Level 2 Ready-to-Read, part of a new series all about pets and the people who owned them! The legendary Mexican artist Frida Kahlo had many pets. Among them was a little parrot by the name of Bonito, the Spanish word for “beautiful.” Frida painted her monkeys, her dogs, and her deer, but when would she be ready to paint Bonito? Discover the story of Bonito and Frida Kahlo in this fact-filled Level 2 Ready-to-Read. In Parrot in a Painting, readers get to learn about the artist Frida Kahlo through the eyes of her parrot, Bonito. At the end, readers learn a few facts about Amazon Parrots and Frida Kahlo. When a raccoon arrives at the White House, President Calvin Coolidge and First Lady Grace name her Rebecca and welcome her as a pet. Rebecca tries to fit in with the other animals already living there. But none of them will play with her! What will Calvin and Grace do? Discover the story of one of the most unusual White House pets in this fact-filled Level 2 Ready-to-Read. Did you know that President Calvin Coolidge accepted various animals, including Pekin Ducklings and South African Lion Cubs, as gifts from Foreign Leaders? So, I guess a raccoon wouldn't be a surprise. 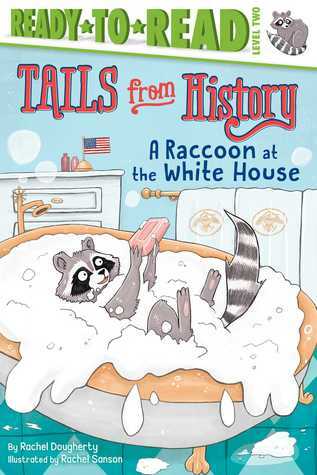 At the end, readers learn a few facts about Raccoons and the White House. For students who are animal fans or have pets, this new series will be of high interest. Both books were releases in hardcover and paperback at the beginning of July. Look for them at your local indie bookstore or public library.